komainu, koma-inu 狛犬 / 高麗犬 / 胡麻犬 "Korean Dog"
and one with its mouth closed, ungyoo 吽形, thus representing the beginning (alpha) and end (omega) of all things. Often a female one has one horn and the male one two.
. Komainu Daijin 狛犬大神 the Komainu Deity .
. koma...　狛　other Shrine guardian animals .
. Kappa komainu カッパ狛犬 / 河童狛犬 Kappa as Komainu . komainu　狛犬 Lit. Korean dog. Thought to have been brought to Japan from China via Korea, their name is derived from Koma 高麗, the Japanese term for the Korean kingdom of Koguryo (Jp: Koukuri 高句麗). In the early Heian period, the two statues were clearly distinguished: the figure on the left, called shishi 獅子 (lion), resembled a lion with its mouth open agyou 阿形; the figure on the right, called komainu 狛犬 (Korean dog), resembled a dog with its mouth closed ungyou 吽形, and sometimes had a horn on its head. the term komainu came to be used for both statues, and their shapes became indistinguishable except for the open and closed mouths a-un 阿吽. 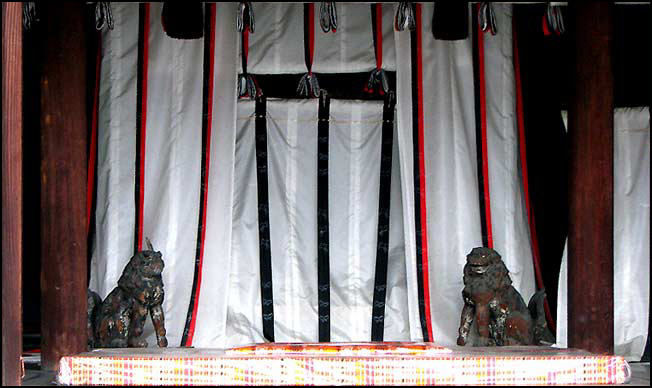 In the Heian period komainu were used as weights or door-stops for curtains and screens in the Seiryoden 清涼殿, Kyoto Gosho 京都御所. the stone figures inside the south gate of Todaiji 東大寺, Nara, made by the 12c Chinese sculptor Chinnakei 陳和卿. 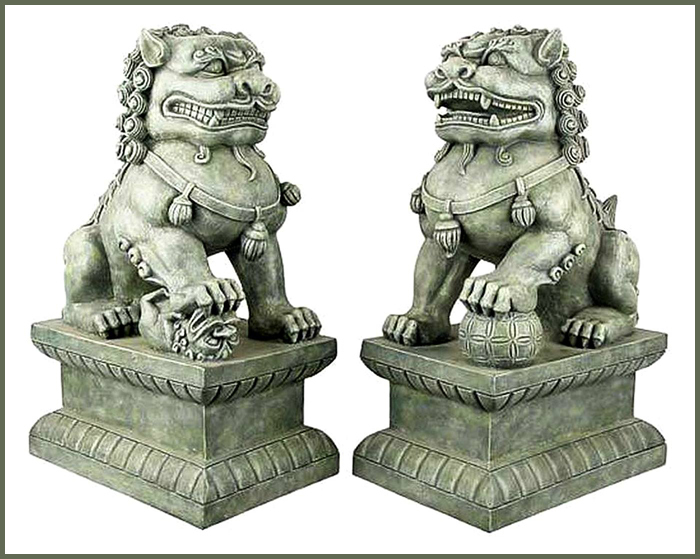 Literally, "Korean lions," paired figures of lion tutelaries found at the entryway to shrine buildings, or alongside their torii or approachways. Also written 高麗犬 or　胡麻犬. although bronze, iron, wood, and ceramic examples can also be found. The paired figures are typically male and female, and in some cases one of the two has horns. In generally, the pairs include one with an open mouth and one with mouth closed, the so-called a-un posture symbolizing the "alpha" and "omega" of the Sanskrit alphabet. In some pairs, however, both are depicted with open mouths. The origin of such tutelary beasts is said to go back to Egypt or India, but the ones transmitted to Japan originated during China's Tang dynasty. Another style was introduced to Japan from Song China during the Kamakura period, and this style is frequently referred to as kara jishi (Chinese lions). The word "Koma" is an ancient term for the Korean peninsula, but since the images were merely transmitted through the Korean peninsula, it may be that the term Koma inu was merely used to indicate their "foreign" nature. As tutelaries, the animals are believed to symbolize the eradication of evil and the protection of the area around the kami. Join the Komainu Gallery on facebook for regular updates ! Statues of these lions have stood guard over Chinese Imperial palaces, Imperial tombs, government offices, temples, as well as the homes of government officials and wealthy families, ever since the Han Dynasty (206 BC to 220 AD) and are honored as having powerful, mythic protective powers. It is not uncommon to see such lions used also as decorative or symbolic motifs in art, not to mention at the entrances to hotels, restaurants, supermarkets, and other buildings — even parks — one sitting at each side of an entrance. Ah, but they are not just common in China, but also in Japan, Okinawa and as far away as my other home of San Francisco. Indeed, wherever Chinese people have migrated, or Chinese culture has exerted its influence, one is likely to encounter fóshī. 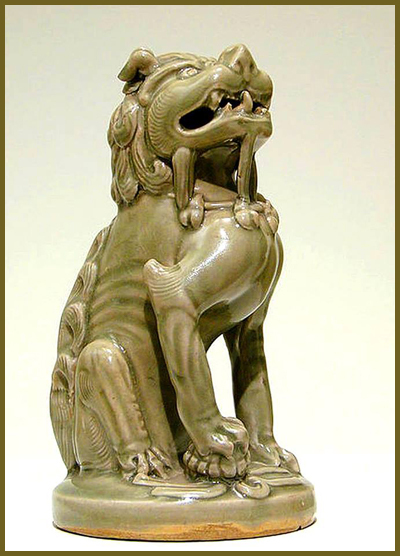 Everything you wanted to know about Komainu, foshi, or "foo dogs". Guardian lions in China are most often set in pairs, consisting of a male lion and a female lion, a representation of yin and yang (the male is yang, the female is yin.) The male rests his paw on an embroidered ball (绣球, xiù qiú), representing supremacy over the world; and the female often has her paw, the one closest to the male, resting (more than likely actually restraining) a cub: a representation of the cycle of life. Tradition says that the female protects those inside the building or place they guard while the male guards the structure or place itself. While the form of the lions was originally quite varied, it has over the centuries become formalized, particularly during the Ming and then the Qing dynasties, into the form we are most familiar with now. Frequently one is likely to also see pairs of fóshī with the female’s mouth closed and the male’s open — said to be symbolic of the utterance of the sacred word “om.” Other styles of fóshī may have both male and female with opened mouths, each containing a single, large pearl. In the case of many such pairs, the pearl is frequently completely carved so that it is free to roll about in the lion’s mouth, but large enough that it cannot be removed. 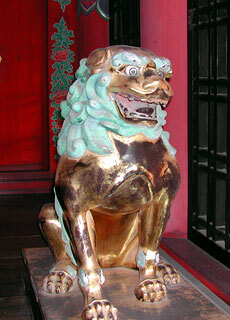 Unlike the “guardian lions” one might see in front of a government or public building for example in the UK or in the United States, which are created to give a somewhat lifelike appearance of the animal, Chinese fóshī are carved with the intent of portraying the emotion of the lion as well as its symbolism. In the Chinese lions, the claws, teeth, and eyes represent power while it is rare that musculature is depicted at all; whereas in the English lion, it is its quite stylized with distinct musculature to portray its power. Correct placement of the fóshī is essential as dictated by the principles of feng shui, ensuring that their beneficial effects are maximized. When, for example, standing in the doorway of a building looking out toward a street, or square, the same direction that the lions gaze at, the male is to be placed on the left and the female on the right; thus, when walking into a building or other place guarded by the lions, the male will be on the right and the female on the left. One often hears, “But lions only exist in Africa!” Truth be told, Asiatic lions were once quite common in Southwest and Central Asia as well; and with the increase in trade, particularly during the Han dynasty, along the Silk Road, the depiction of lions, as well as their pelts, and even caged animals were introduced into China. Various ambassadors to China from the then “West” are known to have given gifts of live lions as tribute. In Japan, one is likely to find a myriad of fóshī, only there they are commonly referred to as komainu (狛犬・胡麻犬) and are likely to be found at Shintō shrines, either guarding the entrance or even inside the shrine itself. In Japan, one is likely to find a myriad of fóshī, only there they are commonly referred to as komainu (狛犬・胡麻犬) and are likely to be found at Shintō shrines, either guarding the entrance or even inside the shrine itself. 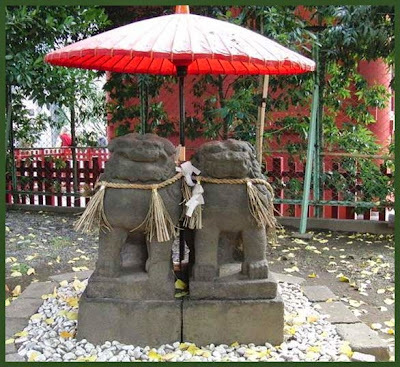 And despite the forced attempt to separate Buddhism from Shintō during Meiji, even the denigration of Buddhism at the time, komainu can also be found at Buddhist temples. Try as it might, the government just never quite managed to separate the two. There are two common forms, the jinnai komainu (陣内狛犬) or shrine inside komainu, which is the older of the two forms, and the sandō komainu (参道狛犬) or the “visiting road komainu) which took shape during the Edo period. 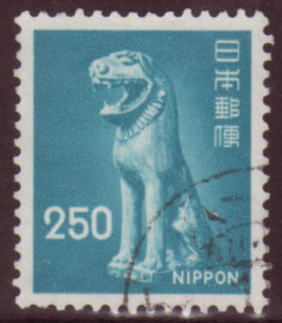 Komainu were “exported” from China to Korea, Japan, and Okinawa; and in Japan proper, they seem to have made their first appearance during the Nara period (710 – 794). They were used exclusively indoors until the 14th century and were then generally made of wood. During the following Heian period (794 – 1185), Komainu were frequently made of metal or stone in addition to wood, and were used as paper weights and doorstops among other things. 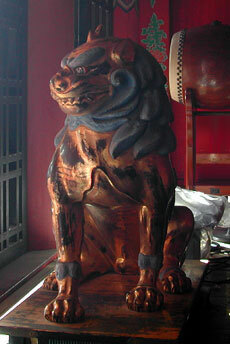 In the Imperial Palace komainu were frequently used to support fusuma (襖). It was also during the Heian (the 9th century) that the statues took on their “mouth open - mouth shut” forms we are most familiar with. 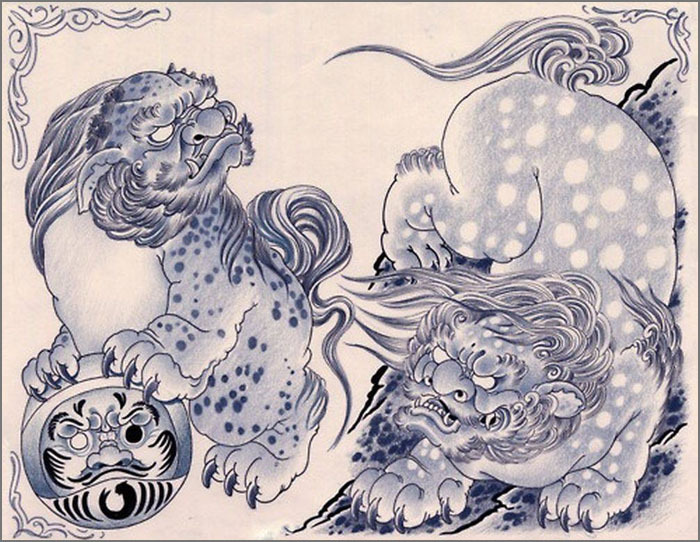 The lion with the open mouth was called shishi (獅子, lion), while the other, with its mouth closed was called komainu or “koguryo dog” because it looked like…a dog — a chow chow, or a Japanese chin, or a Pekinese! Eventually they were both simply referred to as komainu. 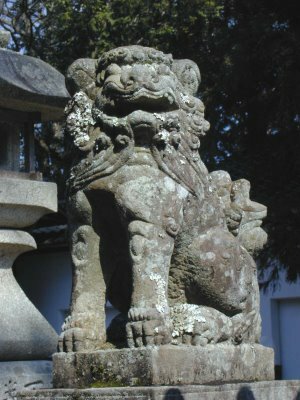 The 14th century saw stone or metal “lion-dogs” moved outdoors in order to utilize its power to ward off evil as the guardians of gates and doors. This applied not just to public or private buildings, but to shrines and temples as well. During the Edo period, komainu were replaced or “assisted” by other creatures such as tigers, dragons and even foxes (Inari shrines) but I have yet to encounter a tanuki as a komainu. Shinto is very important in the Tajimi area (the regions of Gifu-ken and Aichi-ken) like most of rural Japan. You will find more shrines than you could possibly imagine and just as many (times 2) komainu. These are all made by local craftsmen (first stone cutters, the rest by sculptors and ceramic artists). It could easily take years to visit all the shrines - a pilgrimage in itself. 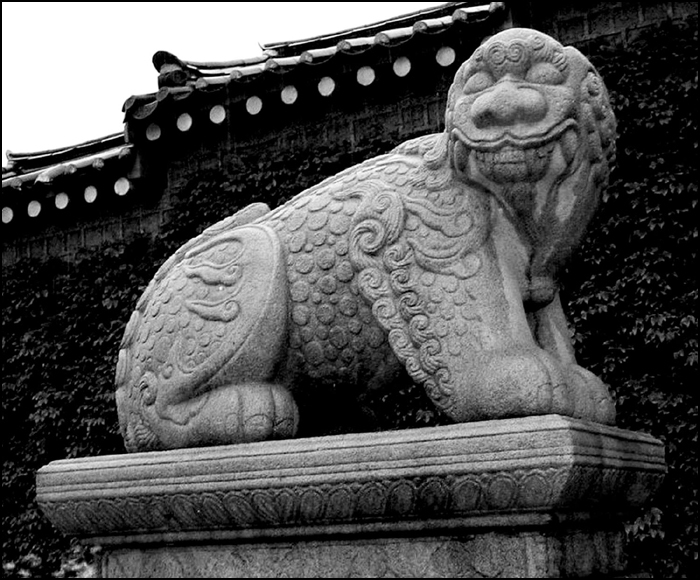 A Korean komainu or haechi (age unknown). We know that lions appeared in Indian temple art and, as early as the third century, showed up in the art of Chinese Buddhism; a symbol of protection of the dharma (the teachings of Buddha). Apparently as time progressed, it was determined that what was good for the Buddha must then also be good for the Emperor; thus, the lions became protectors of the gates and doors of imperial buildings and compounds. Now, the Chinese word for lion is shi 獅 or shishi 獅子; however, another creature that appeared in China at about the same time called the xiezhi, and at some point in time, between the third and seventh centuries, pairs of stone xiezhi made their way to Korea, where the name was pronounced haetae or haechi. The haechi appears very lion-like, but often has a scaly body, a small horn on its head, and sometimes small wings. 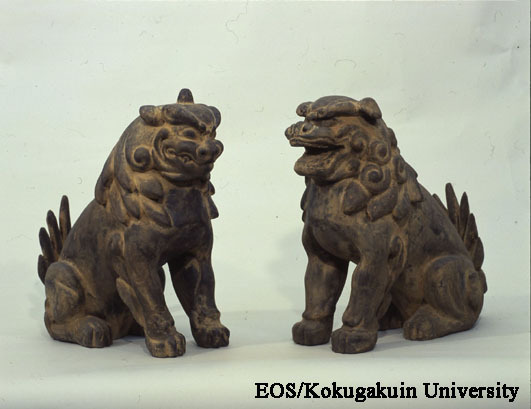 By the Nara period (710-794), lion guardians had journeyed to Japan, typically made of wood and intended for indoor use. By the ninth century, the pair came to consist of an open-mouthed lion (shishi 獅子) and one close-mouthed, horn-bearing, dog-like komainu (Korean dog. 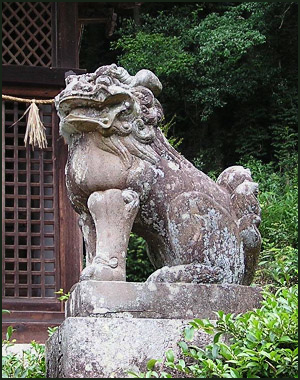 By the fourteenth century the horn disappeared, (although it does show up from time to time) and both animals of the pair came to be known as komainu, largely carved from stone and used out of doors. Pìxiū 貔貅, which is pronounced Hikyū in Japan. Also known in Chinese as Bìxié 避邪 or Tiān Lù 天禄. Also known in Japanese as Hekija 辟邪 or Tenroku 天禄. A composite beast of ancient origin, mostly forgotten in Japan, but still popular today in China, Hong Kong, Taiwan, and Singapore. The mythological dragon-headed, lion-bodied Pìxiū 貔貅 (also spelled 豼貅) were traditionally depicted in China as a male-female pair, one with a single horn (male, Pì 貔) and the other with two horns (female, Xiū 貅), but in modern times they each commonly appear with only one horn. In ancient China, statues of the two guarded the entrance to the tomb, as they are thought to ward off evil and protect wealth. In old China, the beasts were also commonly portrayed with hoofs, wings, and tails, and supposedly appeared on the banners of the emperor’s chariots (兵車に立てた旗). 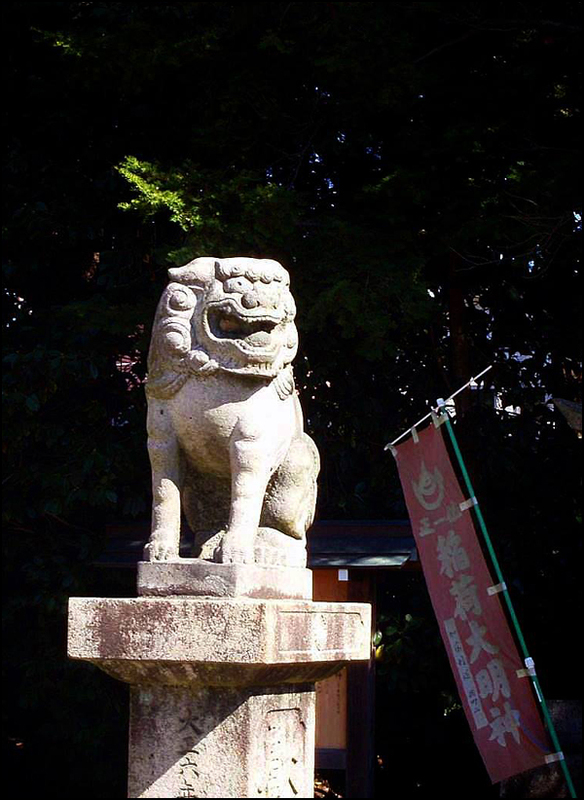 In Japan, the Hikyū are largely ignored, having been supplanted by the Koma-inu (magical lion dogs) and Shishi (magical lions), who traditionally stand guard outside the gates of Japanese Shinto shrines and Buddhist temples. 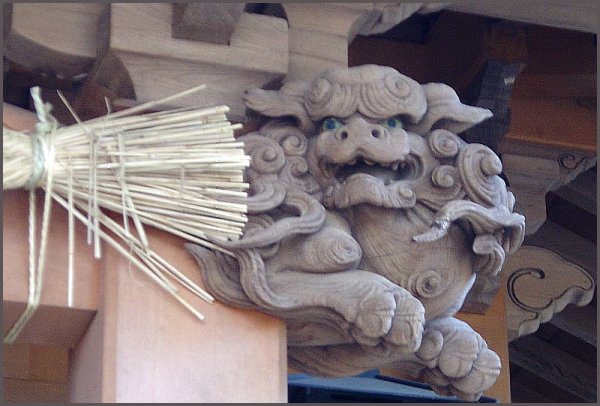 In Japan, effigies of Shishi lions are also commonly used as architectural elements, placed under the eaves of both Shintō shrines and Buddhist temples to ward off evil spirits. 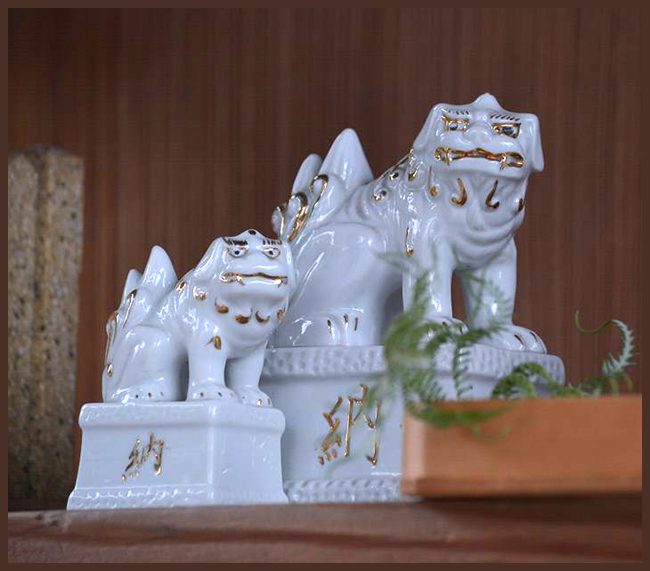 Let us recall that, in China, the Pìxiū also serve this role, and in olden times were commonly displayed on the roof corners of the homes of the emperor and gentry.
. - - - - - Komainu Glossary - 用語集 - - - - - . 編集長の狛犬日記 - very informative ! In 1854, during a fire at the palace, the 獅子狛犬 Lions Dogs from the 清涼殿 Seiryoden Palace were brought to the home of the honorable 一条家 Ichijo Family for safekeeping by a high-ranking official working at the Seiryoden. Later they tried to find this man, but were told such an official does not exist. They said it must have been the spirit of the Komainu.
. 薬師様と狛犬 The Origin of Yakushi Nyorai and Komainu . At 白川村 Shirakawa village there was a wolf who had eaten the bones of a human and they gut stuck in his throat. The villagers helped him when they found him sitting and suffering in the compound of 八幡様 Hachiman Shrine. And the Deity promised to help the villagers from now on. So they changed the Komainu at the shrine and installed statues of wolves. The authorities of 胆沢 Isawa ordered the Komainu in the park to be burried in the ground. But after that, a lot of strange bad things happened in the village, as a curse of the Komainu.
. Kibitsu Komainu 吉備津狛犬 from the shrine Kibitsu Hiko Jinja 吉備津彦神社 . Once the八幡さんの獅子 Lion Dogs from Hachiman Shrine were stolen. But the home of the thief was soon befallen with diseases, fire and other disasters. So they all pledged to bring the Komainu back to the shrine and tried to pull them along with a horse. But the horse could not move, they were too heavy. Then a man took one on his back - and what do you say - it was so light, he could carry it with no problem.